Animal species instinctively behave in ways that help further the survival of their species. Inevitably, this means spending much of their time eating and reproducing. 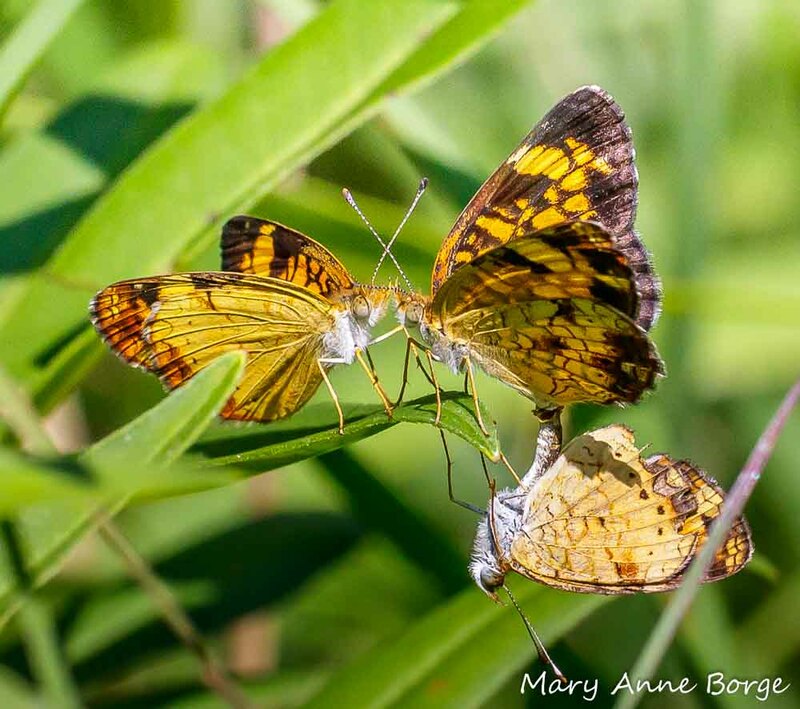 Recently I had the opportunity to observe such behavior in Pearl Crescent butterflies. Pearl Crescents are named for the crescent shaped marking near the center of the submargin of their hind wing. They can often be seen together in groups, nectaring on a variety of flowers, feeding on minerals, and flirting. 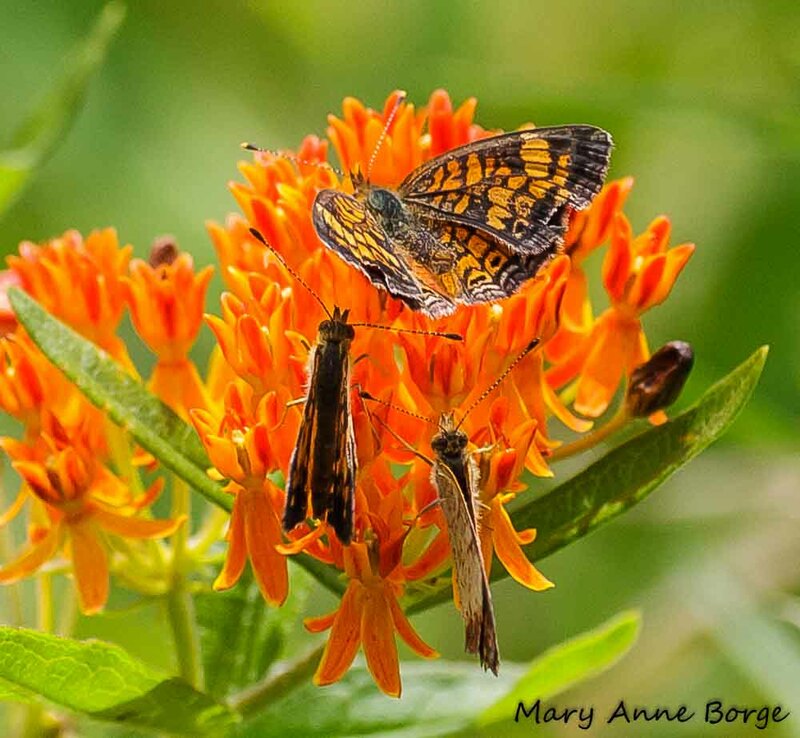 Pearl Crescent female (top) with two males hoping to capture her interest; on Butterflyweed (Asclepias tuberosa). 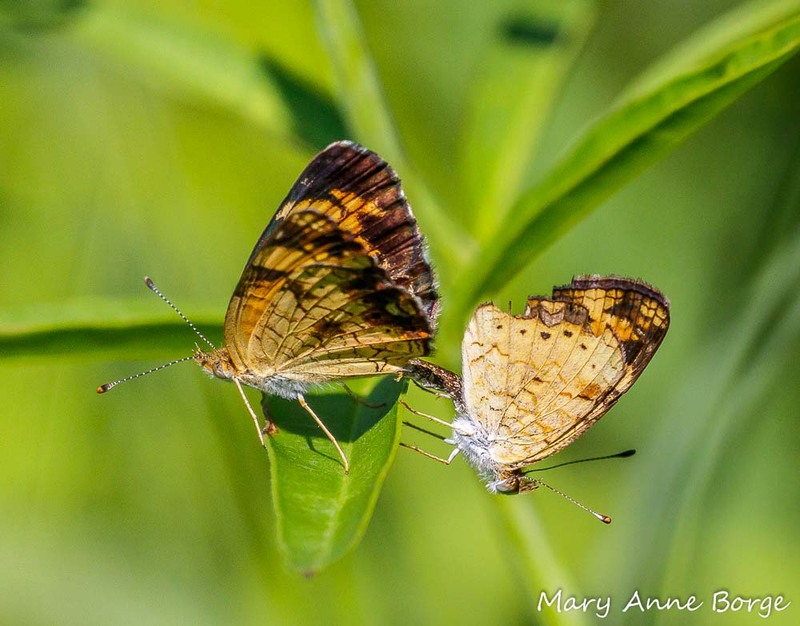 In the photo below, a male Pearl Crescent is doing some serious courting of a female. 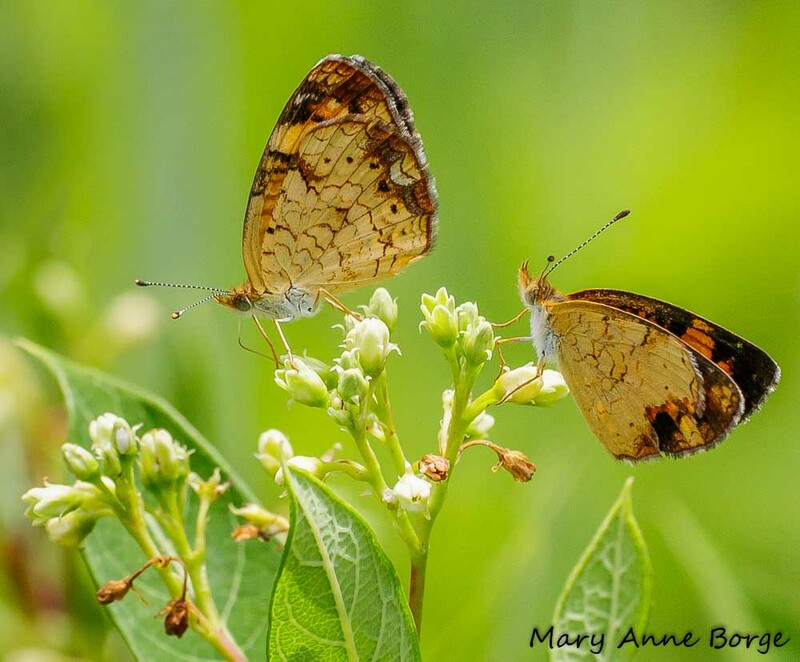 Ignoring him, she sips nectar from Indian Hemp (Apocynum cannabinum) flowers, a species of Dogbane, and an important nectar source in June and early July. 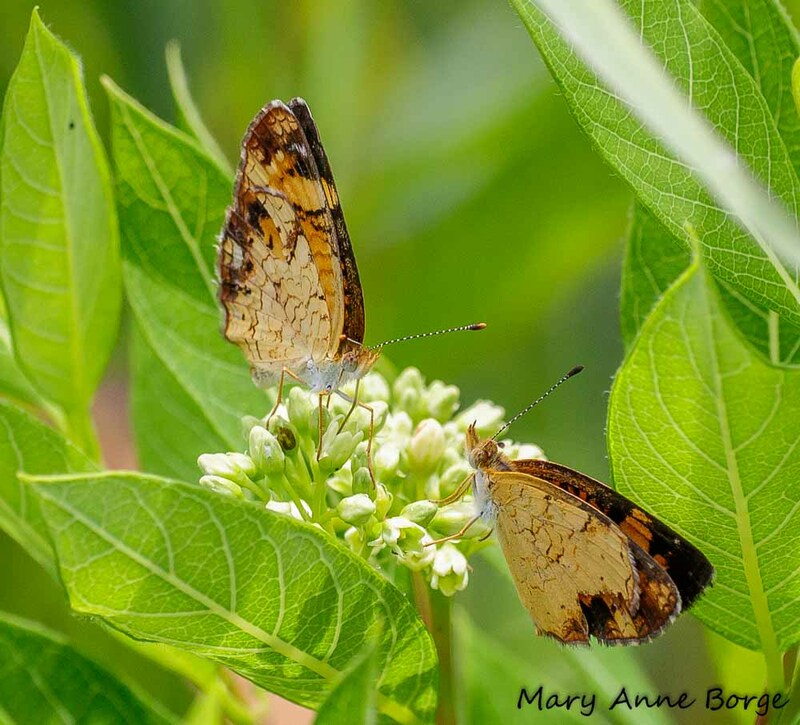 Still in search of food, the female Pearl Crescent flew off to find more nectar, stopping on another Indian Hemp plant. The male followed closely behind. Still drinking, she turned to let him make his case. 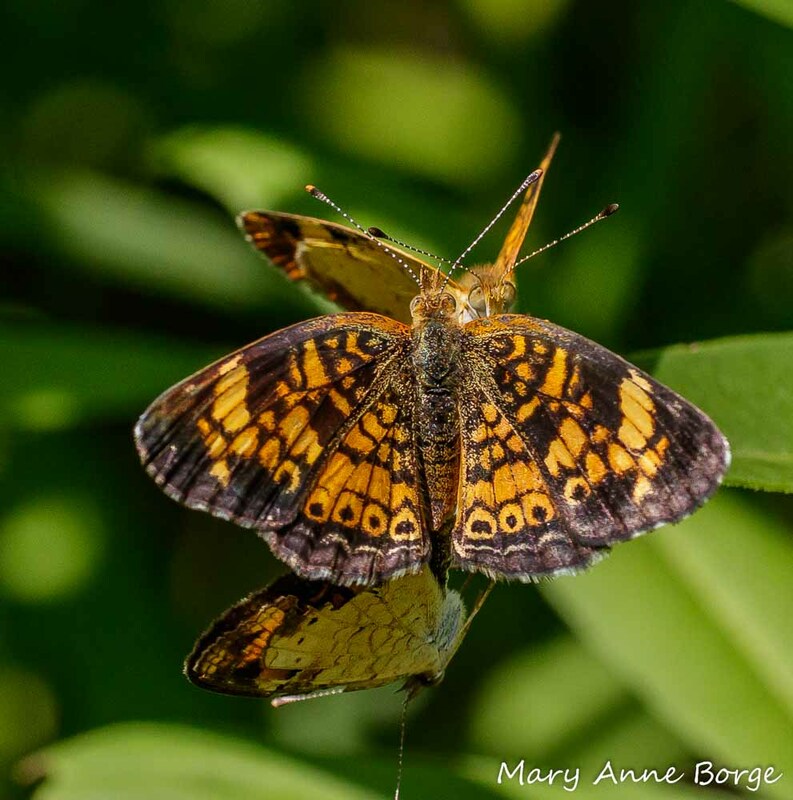 Pearl Crescent male (right in photo) to female (left), “You won’t find a finer specimen of Pearl Crescent manhood!” Unimpressed, she continued to drink nectar. A few seconds later she flew off again, finally turning toward him with fluttering wings; a sign of rejection, at least for now. Later, I spotted a female Pearl Crescent with her wings open. She appeared to be basking. Then I noticed the two other butterflies with her. She was mating with one male, while another, undeterred, continued to lobby for her favors. She remained steadfast. The rejected male flew off, remaining close by in case the female changed her mind. But she elected to stay with her original choice. 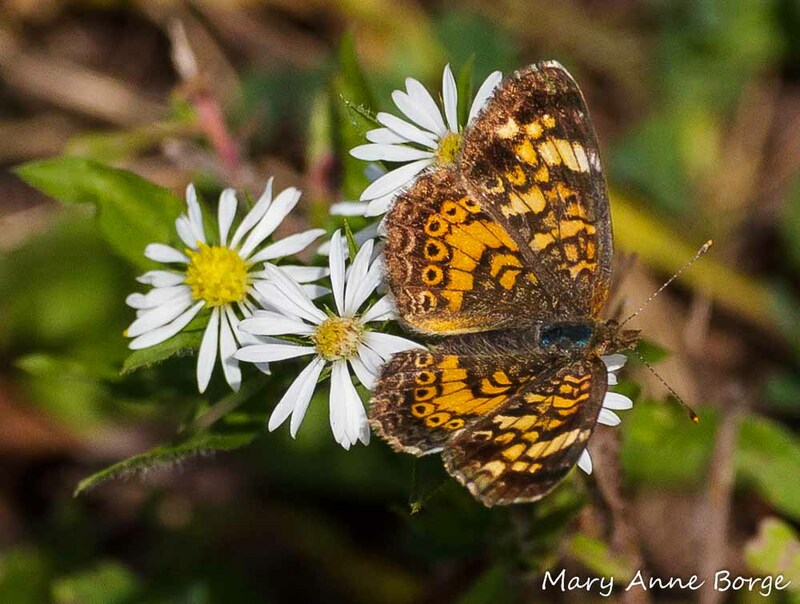 When they are finished, the female Pearl Crescent will seek out the select aster species that her offspring caterpillars will be able to digest. Among the acceptable species are Heath or Awl Aster (Symphyotrichum pilosum), Calico Aster (Symphyotrichum lateriflorum), Panicled Aster (Symphyotrichum lanceolatum), and Smooth Aster (Symphyotrichum laeve). 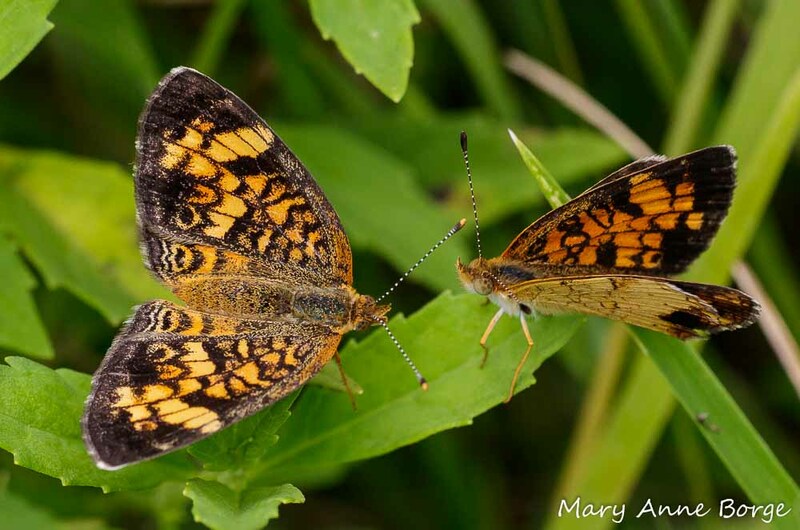 These bright little butterflies are active from April through November in the northern parts of their range, producing multiple broods. In the south, they are active year-round. Pearl Crescents can be found in most of the eastern two-thirds of the US; they are very common in the east. Their range extends into Canada from southeastern Alberta to southern Ontario, and to the south in northeastern Mexico. Look for them in a meadow or garden near you! 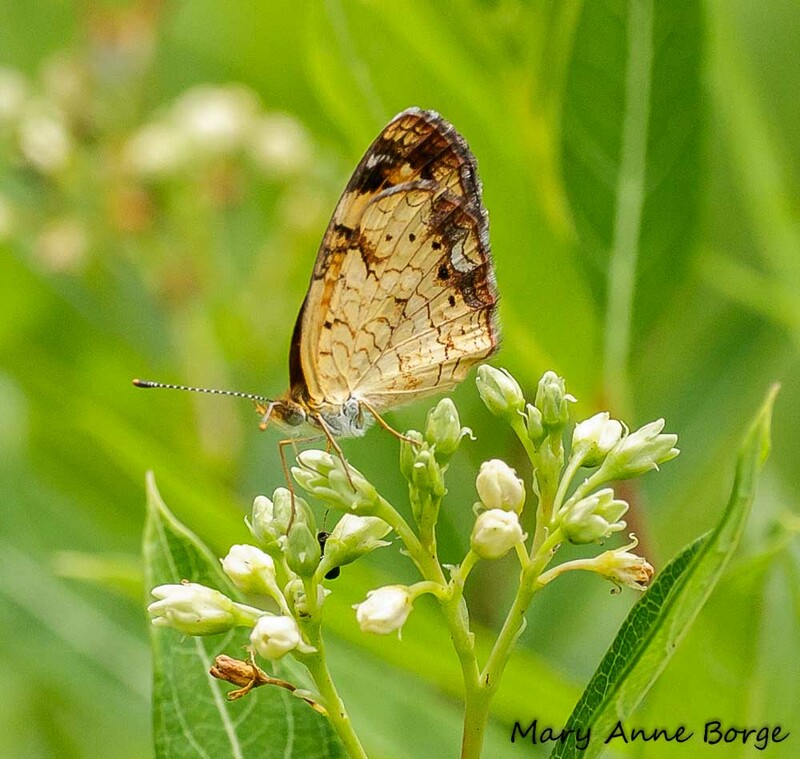 This entry was posted in Butterflies, Native Plants and tagged Apocynum cannabinum, Aster, Indian Hemp, Mating butterflies, nature, Pearl Crescent, photography by Mary Anne Borge. Bookmark the permalink. I didn’t know about the asters! Thanks again for an informative read! Yet another benefit of asters! Wonderful observations, illustrations, and so very funny! Beautifully observed, illustrated, and so very funny! Pretty racy stuff! Wonderful photos, too! I probably should have warned about the adult content! Such romantic drama in the natural world! Thank you for this post!! There’s so much going on around us! We just have to take the time to stop and look! I love your commentary on their dialogue! Thanks, Deedee! I couldn’t resist. Your articles are wonderful!! Thanks! They were such fun to watch! I had to share their story with you.